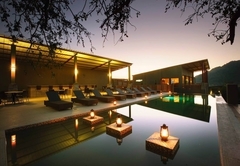 Shepherd's Tree Game Lodge is a 5 star graded game lodge offering Pilanesberg accommodation in 30 guest rooms. 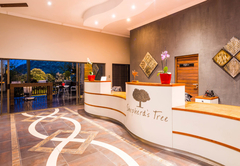 The luxurious Shepherd’s Tree Game Lodge is a lodge concession awarded by the North West Parks & Tourism Board within the beautiful “Big Five” Pilanesberg Game Reserve. 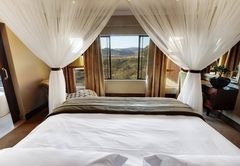 The malaria free Pilanesberg National Park is located in South Africa's North West Province and is easily accessible within a 2 hours from Johannesburg and Pretoria. 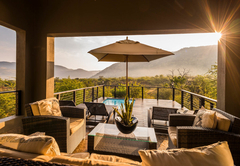 The Shepherd’s Tree Game Lodge nestles in an exclusive use zone in the south-western portion of the 55,000ha Pilanesberg Game Reserve. 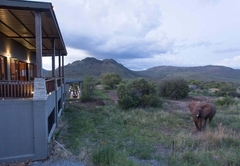 This game lodge offers exclusive traversing as well as access to all the national park’s public roads. 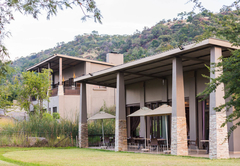 The Shepherd’s Tree Game Lodge lies adjacent to the Wilderness Area offering the opportunity of walking trails in this untouched environment. 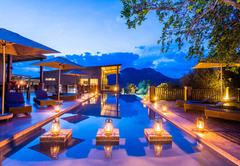 Guests staying at this unique lodge enjoy exclusivity and privacy in a truly spectacular 5 star setting. 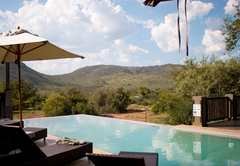 The Shepherd’s Tree Game Lodge consists of a main lodge, 13 family suites of approximately 132 sq. 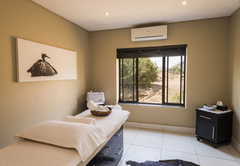 metres each and 4 executive suites of approximately 86 sq. metres each. 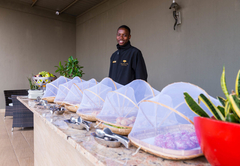 All suites provide a kitchenette, making self-catering optional. 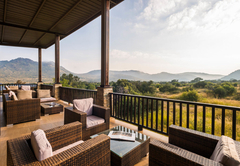 The accommodation provides beckoning views of the distant bushveld valley, and links to several relaxation areas at the Lodge. 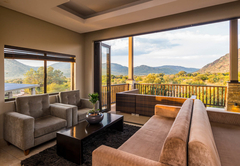 The furniture and finishes at the Shepherd’s Tree Game Lodge reflect true quality, luxury and superlative standards. 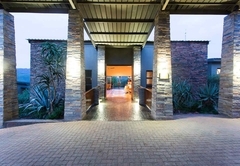 The accommodation at the Shepherd’s Tree Game Lodge in the Pilanesberg National Park nestles around the magnificent main lodge, which is accessed by both road and foot-paths. 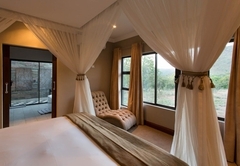 The ideal placement and design of each suite ensures privacy and provides commanding views of the untamed bushveld. 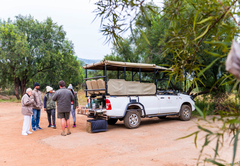 Upon arrival at the private entrance gate of the lodge, guests park their vehicle in the secure guest parking, and then proceed by game viewing vehicle to the Shepherd’s Tree Game Lodge. 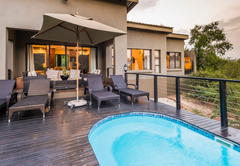 The main lodge at the Shepherd’s Tree Game Lodge provides all the necessary facilities and amenities to make a holiday relaxing, adventurous and unforgettable. 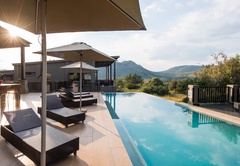 A restaurant, bar, wine cellar, lounge, internet station, swimming pool and deck, and a boma are available to guests. 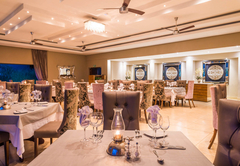 Highest quality equipment with plasma screen TVs and a mini-business centre in every suite as well as a kitchenette is available in every suite for guests to prepare light meals. 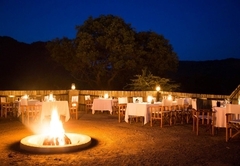 The gourmet restaurant and outdoor boma serve the most delectable cuisines. 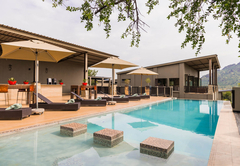 A casual lounge and cigar bar, and a spacious open and covered entertainment deck overlook the spectacular rim-flow swimming pool at the lodge. 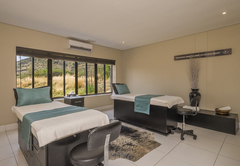 The health & beauty spa ensures the most indulgent and pampered of holiday experiences. 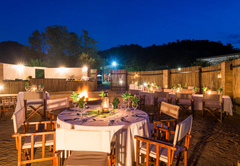 Several secluded salas, which are sheltered and private relaxation decks with daybeds, invite guests for relaxation and dreaming. 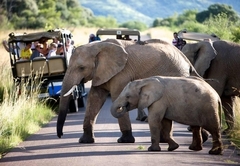 Guests staying at the Shepherd’s Tree Game Lodge have the opportunity to participate in the nature and safari activities in the Pilanesberg Game Reserve, which consists of an exclusive use area. 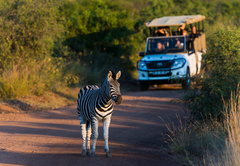 The Shepherd’s Tree Game Lodge offers dedicated game rangers with open game viewing vehicles for unforgettable safaris through the reserve’s untamed bushveld. 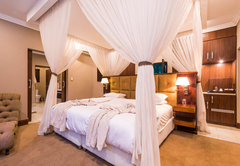 The Standard Suite comprises a main bedroom with an outdoor shower, and features an en-suite bathroom with a patio overlooking the magnificent Pilanesberg Game Reserve. 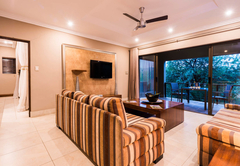 These Standard Rooms can be combined as a Family Room option which, in turn, comprises 2 x Sleeper couches, a covered patio and a flat screen TV with selected DSTV channels. 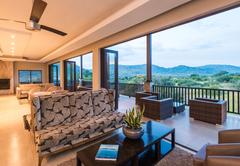 *TV is available for a Family Room booking only – not a Standard Suite booking. 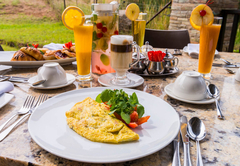 Includes: All Meals and Activities and accommodation. 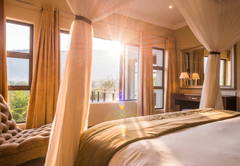 Each Executive Suite offers an en-suite master bedroom, en-suite indoor steam shower, and a double outdoor shower. 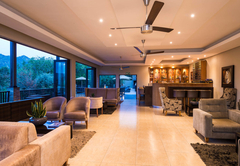 You can also enjoy the convenience of a comfortable lounge with a flat screen television (selected DSTV channels) that leads out onto a patio overlooking the Pilanesberg Game Reserve. 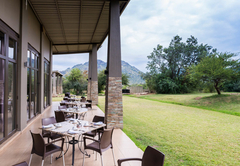 Includes: All Meals and Activities and accommodation. 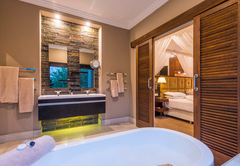 The Private Villa include two en-suite rooms, each with a private outdoor shower. 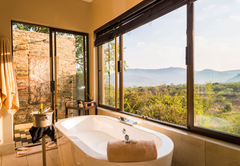 The villaâ€™s patio offers panoramic views of the reserve, as well as a private plunge pool. 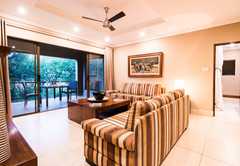 The inside offers a spacious lounge with satellite TV. There was no option to select outstanding! We had a fantastic time, thank you. 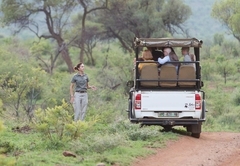 Saw all the wildlife we wanted to including wild dog! 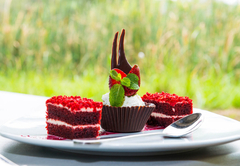 What a treat. Very knowledgeable rangers. Had a magnificent long weekend. Staff and accomodation fantastic. 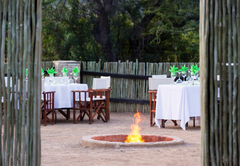 Response timeShepherd's Tree Game Lodge typically responds to requests in 5-10 minutes.